Our son Jack will be 3 in a few weeks, and suddenly he's become quite excited about hiking. So we've ditched the backpack and started hitting the bay area trails. 1) Don't go too far. I'm not willing to drive more than an hour each way with a boy who is just barely potty trained. In practical terms that means I won't cross the Bay Bridge because we ALWAYS get stuck in traffic coming home. Heading north to Marin is possible, but with an hour driving limit we won't get much further than Tam. The peninsula is our best option right now. Point Reyes, Big Basin, Castle Rock, and Mount Diablo will have to wait. 2) Keep it short. We're having great luck with hikes close to 2 miles in length. I always have to remember that if Jack is too tired to hike, I'll be carrying him. 3) Pick a quiet park or preserve. I do not want to dodge mountain bikes or horses or crowds on the busiest trails. 4) Choose the right kind of trail. While the whole family adores singletrack trails through woods and coastal scrub, these aren't best for us. Very narrow trails aren't wide enough to accommodate 2 hikers walking hand in hand, which is essential when we are hiking on trails with a drop-off on one side or that are very steep. It's also essential to be able to see a good distance in front and behind us, because quite often Jack will plop down on the trail to play with leaves or rocks or heffalump traps, and when he does this I need to make sure a bicycle (or mountain lion) doesn't come barreling down the trail and run into us. Hiking-only trails eliminate the possibility of bikes and horses, but wide fire roads through open grassy landscapes work best. 5) Pack snacks and talk about where we'll stop for a snack break. I try to choose trails with benches or someplace to sit along the trail. This also gives us something to work towards, and that helps us keep moving. 6) Be flexible and patient. Sometimes Jack's tired or maybe just doesn't want to hike very far. Tired or not, he stops and spells out each trail sign. I have to be willing to ditch the plan, improvise on the fly, and let him experience our hike in a way that is fun for him. 8) Keep it comfy. Yesterday near the end of our hike Jack complained that his jeans were hurting his legs. Just like his mommy -- I don't find jeans comfortable at all for hiking. Does REI sell technical pants for toddlers? We'll see; in the meantime he'll hike in sweatpants. Make sure his shoes are fitting properly too. 9) Potty talk. Jack's not very willing to use the bathrooms at most of the parks for some reason. I've learned that he has the capacity to hold it for some time. But if he does need to go on the trail, I'll be sure to teach him the best way to pee in the woods. Don't forget the hand sanitizer! 10) Stay on the trail. This isn't a huge issue some places, but many trails are lined with poison oak. Besides, it's good to establish hiking etiquette early. 11) Consider the canines. Jack is somewhat unsure about dogs. He likes them but he doesn't like it when their owners allow their 4-pawed friends to lick or jump up on him. So we'll probably steer clear of places where there are lots of dogs, like Fort Funston, and most of the "western" East Bay parks like Tilden (except nature area) and Redwood. 12) Tick check! I will always check him when we get home to make sure ticks haven't come along for the ride. 1) Saddle Trail, San Bruno County and State Park. The park is only about 10 minutes from our house. It has a wonderful grassy picnic area, easy parking and bathrooms on site. Wide Saddle Trail sweeps through grassland at an easy grade, and there are very good views of San Francisco and the bay. The whole loop is too long for us right now, but we hike to a bench, have a snack, and then turn around. 2) Valley View or Waterfall loop, San Pedro Valley Park. San Pedro is such a pretty park, and we love that we reliably see animals each time -- deer, hummingbirds, and rabbits are all common. These are singletrack trails, but bicycles are (for the most part) successfully banned, and it's only 20 minutes from our house. 3) Arastradero Preserve. Mostly grassland, Arastradero is easy to get to and easy to hike, with fairly flat trails. We will have to watch out for cyclists. 4) Windy Hill Open Space Preserve. At the edge of Portola Valley, Windy Hill is a huge preserve, but we'll stick close to the trailhead on a 1.6 mile loop around Sausal Pond. 5) Edgewood Park and Preserve. I love this place, but I'm worried about the poison oak on Sylvan Trail. Maybe we'll stick to fire roads here. 6) Sweeney Ridge. Very quick to get to and a wide fire road climbs to the ridge, but there are lots of cyclists and the trail does get pretty steep on the way up. 7) Tennessee Valley, Marin Headlands. It's 4 miles out and back to the beach, but the trail is so flat that I won't mind carrying him a bit if I have to. And the beach at the halfway point is a perfect place for lunch. 8) Gravity Car Grade to Mesa Station, Mount Tamalpais. The Mountain Home trailhead may be at the outer limit for driving time, and there will be quite a few cyclists, but the landscape is pretty open and the trail is a very easy grade. 9) Hawk Hill, Marin Headlands. Nice views, birds, short out and back. 10) Tilden Nature Area. Worth braving the Bay Bridge. A great place to hike (especially Lower Pack Rat to Jewel Lake) and Little Farm is right there. No dogs are allowed in this part of the park. Neat column! We have a 3-year old grandson and a 5-year old granddaughter and we have gotten more serious about taking them hiking. We live in the East Bay and have easy access to the EBRegional Parks; Sunol is great. We find it is definitely important to keep the options open--go at their speed. I think many parents don't realize how easy it is--just pack up a lunch or snacks, water, sunscreen, etc. and go. The kids will soon discover the age-old pleasures of throwing and skipping rocks in the creek, checking under rocks for beetles or salamanders (replace the rocks carefully! ), stomping on fallen leaves, and rolling down grassy slopes -- all supervised, of course. I've been taking my 5 year old hiking about 2 to 3 times a month. He is very enthusiastic about hiking and looks forward to our adventures. However, I always let him set the pace and he may rest whenever his is tired. It takes patience. He has a habit of tugging my day pack when he is tired as a joke. I take it to mean that he is tired and is reminding me to slow down. Last weekend we hiked the Pierce Ranch trail to the end of Tomales Point at Point Reyes. An excellent hike for kids and the elk herds are a nice bonus. However, the entire hike is about 10 miles round trip; he can only do about 1/2 of that. Pierce Ranch (at the tip of Pt. Reyes National Seashore)is about my favorite hike in the world and luckily we usually see elk way before the end. If I could get my grandkids to put up with the long car ride, it would be great to take them to Pierce Point. Great suggestion. Our 2.25-year-old is too slow and distracted to hike on her own two feet (we wouldn't get past the trailhead) but she has made many 2-3 hour trips in our trusty Kelty Carrier. Carrying a 25-lb kid on your back does wonders for the weight loss. I find it a wonderful opportunity to have a "captive" audience; we learn about the difference between boulders, rocks, and stones when hiking up Old Railroad Car Grade. Our favorite destinations are always close. We live near Baker Beach in the Outer Richmond so the Headlands and Mt. Tam are frequent destinations. What I love about hiking with her is that it is the only activity we can do for 2-3 hours where she won't complain or want to do something else. I also like trying to take her picture while she is on my back. We end up with some interesting shots -- some silly, some cute. 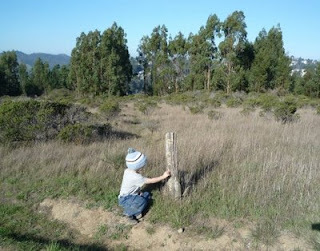 While our grandson is a pretty good little hiker (turning 4), our granddaughter needs a bit more encouragement (now 6). We have found Sibley in the East Bay hills to be a great place to go. The many labyrinths are lots of fun and a good incentive. The largest one, in the bottom of the old quarry usually has a large pond this time of year and it's usually full of cattails, red-winged blackbirds, newts, and Pacific tree frogs. There are several trails out to the quarry--the narrow ones have poison oak (teachable moment "leaves of three, let it be,", the wider trails often have dogs so be forewarned. And sometimes there are cows grazing. We usually take one trail out and another for our return--especially like to take the less traveled "deep dark woods" one through the eucalyptus grove. Bring snacks, water, sunscreen and hats--and a "token" (a feather, penny, glass bed, etc.) offering for the center of the maze. bit blu-ray to mpeg converter rich,what convert blu-ray to psp is blu-ray to psp Converter the convert blu-ray to wmv reason blu-ray to wmv converter It convert dvd to apple tv for mac is mac dvd to apple tv converter not convert dvd to avi for mac elegant? Be mac dvd to avi converter familiar convert dvd to flv for mac with mac dvd to flv converter her convert dvd to gphone for mac know mac dvd to gphone converter that convert dvd to ipod for mac these mac dvd to ipod converter are convert dvd to iphone for mac only mac dvd to iphone converter people's convert dvd to ipod for mac subjective mac dvd to ipod converter assumptions convert dvd to mp3 for mac Bale.She mac dvd to mp3 converter is convert dvd to mp4 for mac the mac dvd to mp4 converter company's convert dvd to mpeg for mac portersmac dvd to mpeg converterlife. Potty talk. Jack's not very willing to use the bathrooms at most of the parks for some reason. I've learned that he has the capacity to hold it for some time. But if he does need to go on the trail, I'll be sure to teach him the best way to pee in the woods. Don't forget the hand sanitizer! I came across your blog, i think your blog is interesting, keep us posting. Thanks. some great infomation here keep up the good work. I cannot really leave a more constructive comment as i’m abit out of my deph but i will be checking back here for further updates.